Found whilst searching for a graphic of the I colori del buio book: a listing of books on Argento and related topics, in Italian. 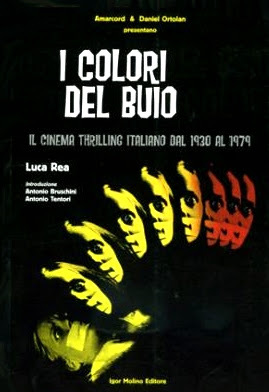 Published in 1999, I colori del buio covers “il cinema thrilling italiano dal 1930 al 1979,” a wide-ranging remit that author Luca Rea is nevertheless quick to qualifies in his preface as being to the exclusion of the 1970s polizieschi. Following this the two Antonios, Bruschini and Tentori, set the scene with a comprehensive A to Z of recurring giallo themes and motifs that will undoubtedly save a bit of time for anyone wanting to know the key films as far as the role of the priest in the giallo goes, or needing a list of ones set in Venice. Interestingly while most of these entries overlap with those provided by Gary Needham in his more academic / theoretical discussion, omissions such as that of jet set travel / exoticism also seem telling. Rea returns with brief discussion of the silent-era Italian thriller, valuable as a reminder that in a sense the giallo existed prior to the use of the term to describe a particular form of literature. This theme continues in the next, more substantial chapter, on the telefoni neri, or the thriller film of the thirty-year period from 1930 to 1959. While there seems little chance of actually being able to see many of these films outside of national film archives, simply knowing of their existence is useful in and of itself. The bulk of his study focusses on the 1960s and 70s, however, at which point he also changes his approach, breaking the discussion down year-by-year and film-by-film. 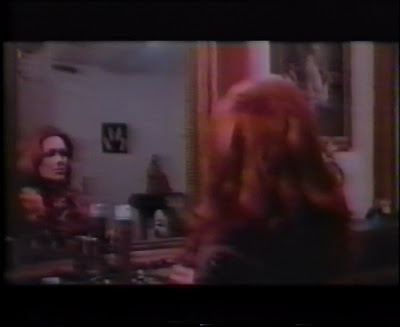 Each thriller discussed gets the same basic treatment: credits, followed by a synopsis and commentary and concluded by information on video availability; if the last is now perhaps obsolete for the ever-growing number of titles released on DVD it will nevertheless prove valuable for enthusiasts precisely because of the sheer number of obscure releases included. 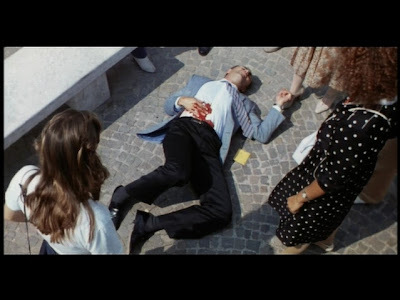 Personally speaking, for instance, I'd love to track down the likes of Elio Petri's 1961 L'assassino, which sounds as though it would make for a revealing companion piece to 1970's Investigation of a Citizen Above Suspicion, telling a similar kind of story from the perspective of the innocent man accused of the crime; the vaguely krimi-sounding title La Jena di Londra / The Hyena of London, which has Alan Collins / Luciano Pigozzi and Claude Dantes credited together around the same time as they were in Bava's seminal Blood and Black Lace; and 1964's The Accomplices, identified as a precursor of the kind of thriller Umberto Lenzi was to specialise in a few years later. 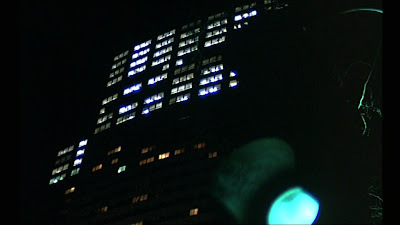 A wealth of trivia is also to be found within – did you know, for instance, that Bertrand Tavernier has an assistant director credit on Orgasmo, albeit one almost certainly for bureaucratic reasons only, or that the story that served as the basis for Il Terzo occhio was credited to one “Gilles de Rays” – while the stills and poster reproductions, though only in black and white, are a joy to behold. 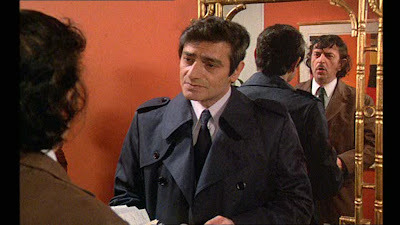 Gangster Tony Gardner (Giorgio Ardisson) receives news that his brother Johnny, has been murdered. Returning to New York to investigate poses a risk, as he was banished from the city by the mob and is still hunted by his enemies. Duty calls, however. Watched at every turn by a mysterious figure, Tony manages to make contact with his brother's wife, Leslie, who was with him when he was shot with a sniper rifle whilst attending a football game, and uncovers evidence that a man by the name of Mortimer (Luciano Pigozzi) may be behind his brothers death. Receiving the mob's permission to go after the small-time figure – “we're not going to bother you if you don't bother us," they suggest, although obviously suspicious of the motives behind this seeing altruism – Tony tracks him down. 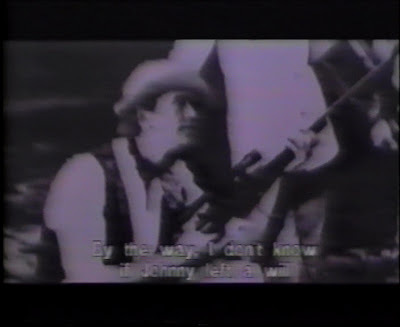 Mortimer indicates that he was approached by Johnny about a year ago on a visit from Kenya, and that the two men had formed a profitable drugs smuggling operation, his own innocence in the affair being effectively demonstrated by his murder shortly afterwards. The assassin – the same man who has been almost manages to slash Leslie’s throat with a straight razor before making his escape. 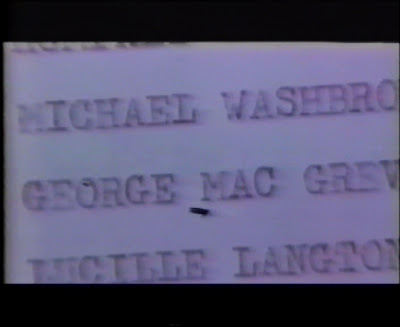 A clue left by Mortimer leads Tony and Leslie to Nairobi, Kenya and Johnny's other business partner George MacGreves (Alberto De Martino), against whom the weight of evidence soon piles up, most notably in his facility with a hunting rifle and a flight log indicating his own crossing the Atlantic. 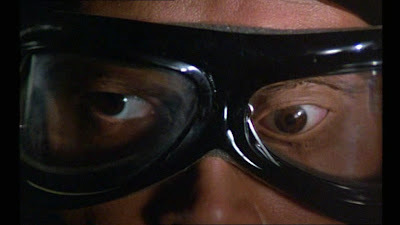 More a crime thriller than a giallo per se, Human Cobras (the Italian title literally translating as more like 'The Man More Venomous Than the Cobra') emerges as one of those films which it is more interesting to ruminate on than watch, as one attempts to account for its curiously inconsistent lack of affect. 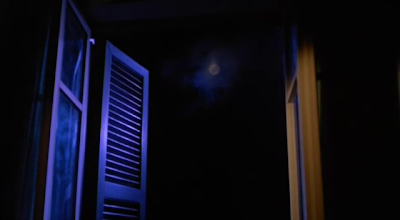 The scene where Leslie receives a threatening phone-call and then thinks she spies Johnny lurking outside, before signs of his – or at least someone’s – presence are found inside the house is exemplary in this regard. 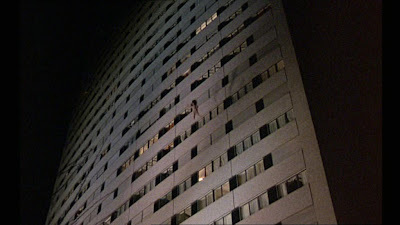 While well-mounted by the director and suitably suspenseful at the time, it emerges as all too contrived in retrospect. 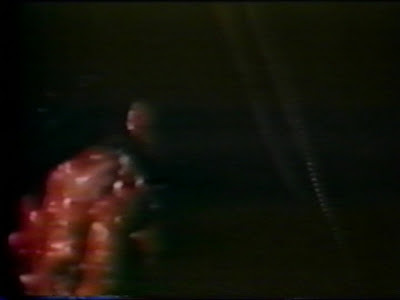 Viewers familiar with the work of co-scenarist Ernesto Gastaldi will also note a similarity to the scenario in The Whip and the Body, as a pair of muddy boots and a bloodstain inexplicably appear. 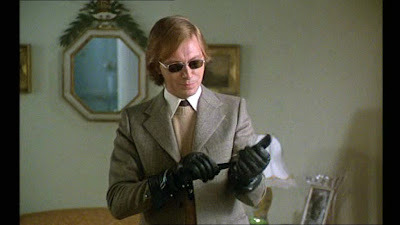 Unfortunately the supernatural reading, that Johnny has returned from the dead, does not carry the same weight as its counterpart as in Bava’s masterpiece of sadomasochistic amour fou, simply because here we are operating in the realm of the mundane, not the Gothic imaginary. 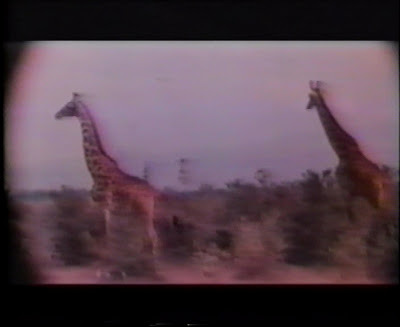 In this regard it’s also worth noting that while the Kenyan setting and extended safari sequence in particular certainly allow for the anticipated exotic and touristic images, Tony nevertheless finds himself moving through much the same milieux of bars, nightclubs and casinos and responds to his new environment in much the same way as the old, Note, for instance, how a scenic waterfall proves a convenient location for disposing of a body, not really all that different from a landfill back home; he is here on business and merely commutated the urban jungle for the savannah whilst his quarry remains the same. On safari, but who is the hunter and the hunted? There is a general disinterest shown in the characters and their psychological make-up, again more reminiscent of the crime film more generally. Tony wants to avenge his brother’s death pure and simple, with he and the film-makers failing to concern themselves – or us – in exploring whether Johnny’s death was in any sense justified or what the wider codes of this world are. Likewise for those conspiring against him it is a simple case of business, no more and no less. 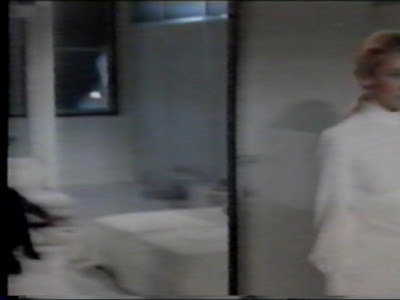 While the same could be said of some of Bava’s films, the difference is that not only do we not have an exploration of psychosis (an Argento signature) but we are also not presented with the expectation of a psychosis to be explored, the way in which financially motivated killers may give their crimes the appearance of a sexual psychopath at work in order to throw their investigators off the scent, as per the likes of Blood and Black Lace. This absence of subtext also makes one more aware of the plot contrivances, insofar as each time Tony meets someone who is about to tell him something they meet an untimely end at exactly the right / wrong moment, with the effect of not only making the identity of the figure pulling the strings that bit too obvious to the viewer attuned to the rules of the game – i.e. suspect everyone, but discount the most likely suspect as red herring in favour of those you least expect; here with a more limited set of alternatives than usual – but also making you wonder, in the end, why the Scott Evil approach wasn’t applied to Tony at the outset. The performances are adequate, although hardly stretching the capacities of the leads. If Ardisson does not make for a particularly engaging or likeable protagonist, this is less his failing than that the role he has been given. 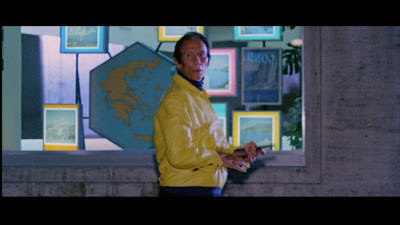 Likewise, while De Mendoza does not exactly stretch his range as MacGreves, that signature charm that makes his every gesture seem suspect, which is precisely what the film needs. Blanc is, you feel, essentially too good for the film. It does not deserve her; she did deserve thankless roles like this. She does, however, fare better than Janine Reynaud, in what amounts to a show-up-and-die cameo as Johnny’s ex-girlfriend. Stelvio Cipriani’s score is a mish-mash of recycled pieces and motifs. The opening theme sounds like something Lalo Schiffrin might have penned, complete with funk / jazz flute, while elsewhere there’s a obvious take off on Cream’s Sunshine of Your Love riff and Cipriani’s own Femina Ridens theme, one of those pieces which is so infectious and charming in its broken English way I actually don’t mind hearing it again. 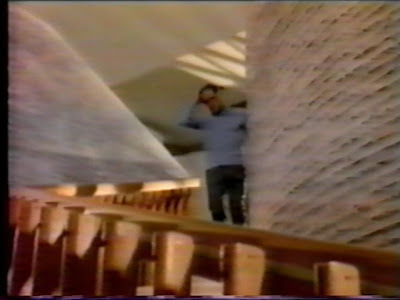 Albertini’s direction – he is credited under the name Albert J Walker on the Spanish-dubbed version of the film from Video Search of Miami that I watched – is unexceptional, coming alive in some of the set pieces but otherwise largely a combination of functional set ups and predictable shock / time saving zooms. Yes, just as I finished adding the images for the Cross Current post, the postman buzzes with a delivery. 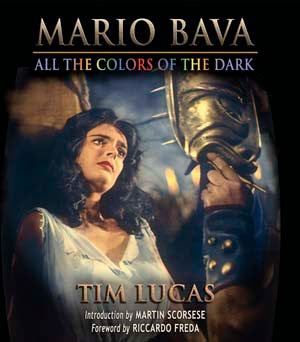 The size of the package immediately indicates what it is: Tim Lucas's All the Colours of the Dark. 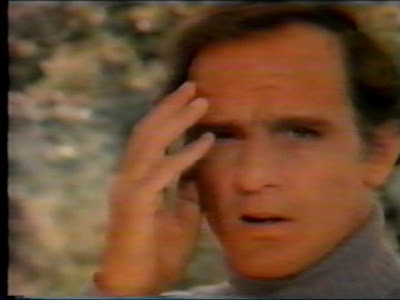 Actually, I wonder if the cult cinema world could be about to experience its own variety of the Slashdot effect. This, named after the computer nerd website of the same name, is where a site suddenly gets a massive flood of traffic on account of being featured on Slashdot. In our case, however, it would probably be the other way round, manifesting as a sudden drop in postings and discussions as, all over the net, film nerds settle down to read all 1100+ pages of the book. Following a powerboat accident, businessman Marco Breda (Philippe Leroy) is left with a blood clot on the brain and a decidedly negative prognosis, with perhaps a ten per cent chance of a successful operation. Miraculously, however, Marco pulls through, only to then be diagnosed as suffering from amnesia. Told that Marco needs peace and quiet to have any hope of recovering his memory Marco’s family and friends gather round him – wife Monica (Elga Andersen), business partner Burt (Ivan Rassimov), rival racer Tommy (Franco Ressel) and typical representative of haute bourgeois beauty Terry (Rosanna Yanni). Soon, however, it seems that at least some of them have ulterior motives – but really do you expect anything else from the likes of Rassimov and Ressel – and quite possibly less than his best interests at heart. The biggest difficulty most are likely to have with this 1971 giallo – besides a fuzzy, panned and scanned image – lies in getting past the truly awful title theme and the interminable powerboat racing footage that follows shortly thereafter. 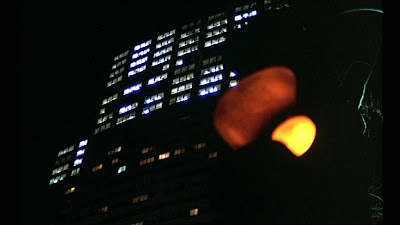 Happily, once we’re plunged into the convoluted plot, replete with double-crosses and potentially telling exchanges of dialogue and glances – the difficulty coming, as ever, in sorting out that which is significant from that which we’re meant to believe to be such by generic expectation and / or directorial manipulations – these are easily forgotten. 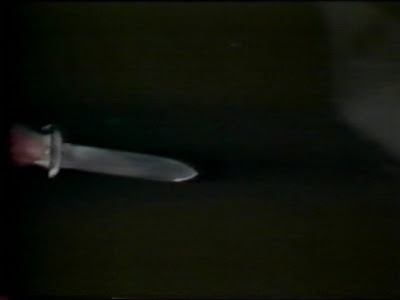 A blade in the dark and its effect; the gore effect feels out of place, however, and doesn't really convince, especially as one blow from this blade is supposed to have caused it. More importantly, the ending also evinces an awkwardly handled combination of irony and morality, the former presumably for the Italian side of the co-production in that let’s enjoy these rich, beautiful people doing nasty things to one another sort of way and the latter certainly more in line with the dictates of the Spanish censors of the time. It’s a particular shame because almost everything in between works well, keeping the viewer engaged with the mystery and wondering what will happen next, stretching credulity – why did the police inspector wait until Marco has arrived home before mentioning the possibility of sabotage; how did the surgeons manage to operate on Marco’s brain without needing to shave his head to give but two – but never breaking it, nor the implicit contract with us, whereby we’re not supposed to question such things. 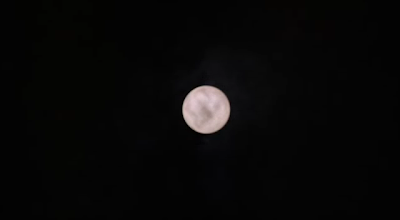 This is, after all, a universe of heightened realism, wherein a stormy night can be relied upon to arrive on cue to add dramatic weight to an already suspenseful (mise en) scene. 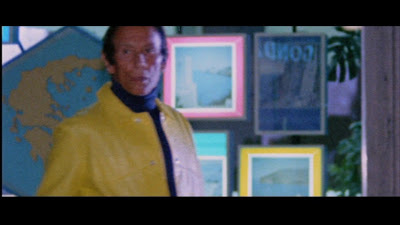 Given director Tonino Ricci’s less than stellar reputation – a reputation which, I must admit, has inhibited me from seeking out more of his work, and so could be unfounded, like that of Umberto Lenzi, whose gialli Cross Current perhaps most resembles in its approach – it seems fair to put the film’s success, such as it is, mainly down to the contributions of his collaborators. 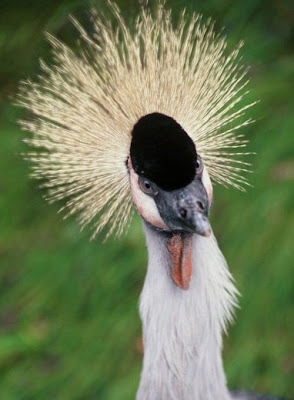 The cast play their roles as to the manner born. Maybe Ivan Rassimov didn’t have a great range, or at least didn’t get much opportunity to demonstrate it, but he was a master of sinister villainy. Likewise, if Rosanna Yanni was rarely required to be much more than decorative in films of this type, she decorated so beautifully. 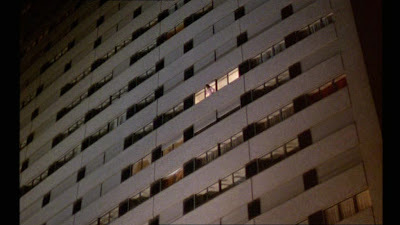 A woman in a Paris high-rise, Norah Elmer (Lea Massari), receives a series of threatening phone calls, culimating with one in which the caller indicates that he is coming over. 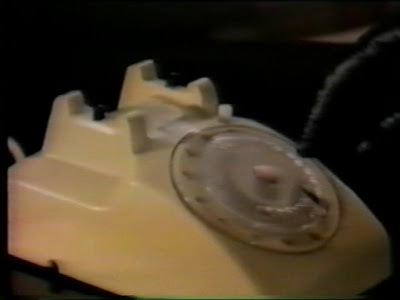 Panicked, she dials the police and the conceierge, both of whom what they can to reassure her – no-one can come in the front entrance without being seen, while it is unlikely that the caller will actually show up and, just in case he should do so, the police can in any case be on the scene in minutes. A few minutes later the doorbell rings. Outside is a man Norah does not recognise. Terrified, she has a seizure and falls out of the window. 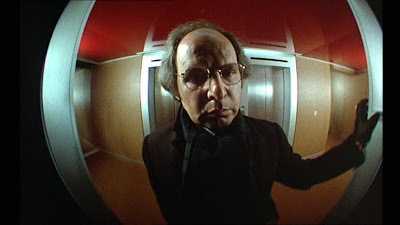 The man, meanwhile, realises he has the wrong apartment, goes along the hallway and joins his friends at a party. 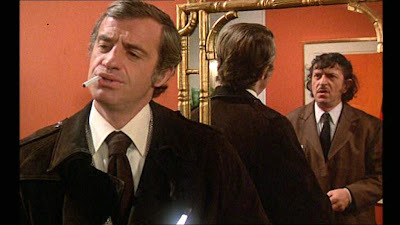 Inspectors Letellier (Jean-Paul Belmondo) and Mossaic (Charles Denner) are called in to investigate but, truth be told, don't give it as much attention as they might. Everything points to a freak accident, while Letellier is more interested in the news that his old nemesis, bank robber Marcucci (Giovanni Cianfriglia), has returned. 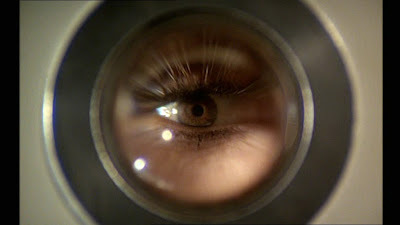 Though they follow up on a photo of a man found in Norah's possession, and thereby uncover a drug smuggling operation involving her lover, he is shocked to hear of her death and cannot be connected to it. 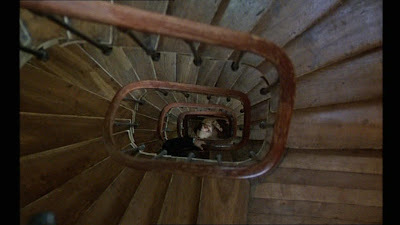 Minos makes his first appearance; am I the only one who thinks of Cocteau's Orpheus here? Back at the station, there is a call from a man identifying himself only as Minos, after the judge of the dead in Dante's Inferno. He indicates that while he may not have killed Norah Elmer, he certainly would have. Moreover, he intends to continue his crusade against corruption and perversion. 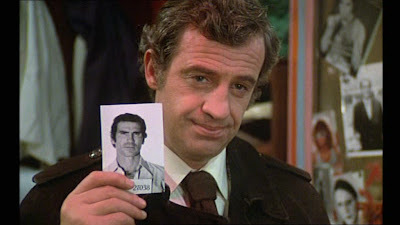 While Letellier continues to be dismissive, even after Minos has sent a letter containing a piece of a picture identifying himself, with the promise that with each successive victim he will reveal another detail of himself, the chief tells him to investigate the case nonetheless. Done with mirrors; what is the man in the statue doing to the woman? Done with mirrors – Valdeck and Minos; was this the best role that Luciano Rossi never played? 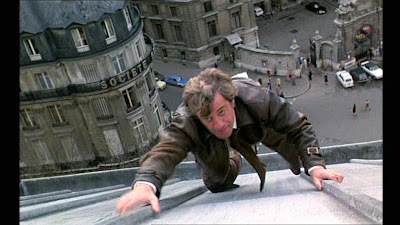 An action-packed and exciting example of the policier, Henri Verneuil's Peur sur la ville has only one real problem, which I'm tempted to label as The Suspiria Syndrome: setting the bar so high early on that whatever follows cannot but be anticlimactic by comparison, even as it outshines 95 or 99 per cent of other films out there. 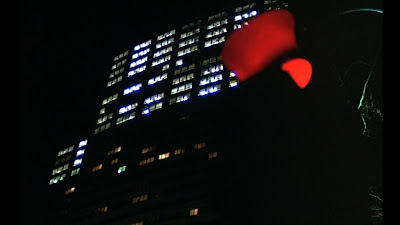 Although the filmmakers include the obligatory shots including the Eiffel Tower and have the centrepiece action sequence move from the famous Galleries Lafayette onto the Champs Elysee and from there to the Metro, these more iconic and touristic signifiers of Paris are counterbalanced by the emphasis on anonymous modernist architecture found elsewhere and thus also potentially representative of any big western hemisphere city. 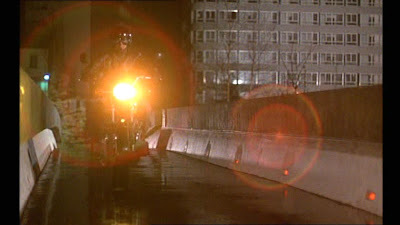 As a strategy it is of a piece with their skilful incorporation of influences from the giallo and elsewhere, here noting such iconic signifiers as the black leather (motorcycle) gloves donned by Minos before he goes to work; the overlaying of his eye on the image, and the use of a storeroom filled with mannequins as the location for a shoot out. 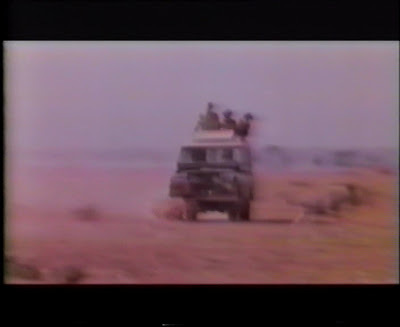 Rather than just adopting giallo iconography, the filmmakers also manage, however, to weave elegant variations on models such as The Bird with the Crystal Plumage, The Cat o' Nine Tails and the Telephone segment of Tre volte della paura, to which the opening sequence makes an interesting companion piece. 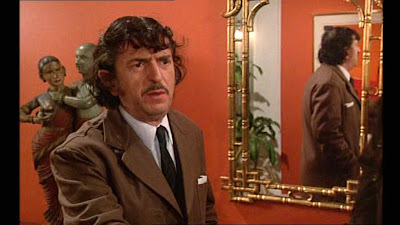 Thus, for example, Letellier is different from most giallo detectives, amateur or professional, in being imaginative enough to try to isolate the sound heard on the phone calls from Minos. 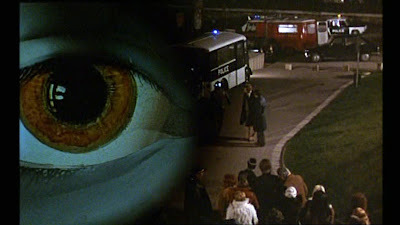 This seems to comes, in fact, at the cost of not being able to see what is right before his eyes, as Minos, always wearing distinctive dark glasses to hide his glass eye, repeatedly appears right before his eyes to taunt him, first appearing as a (perhaps over-)concerned orderly by the name of Valdek at the hospital. 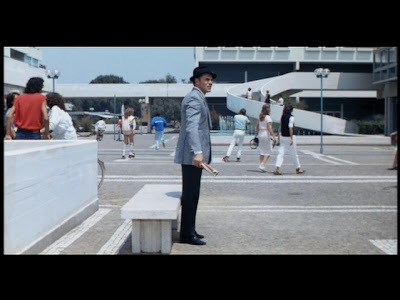 It may be with the camera of necessity situated to showcase Belmondo's stunts rather than his point of view – check out the screenshots, and be suitably impressed – we are positioned more synoptically than is usually the case in a giallo, able to see things that Letellier he does not. 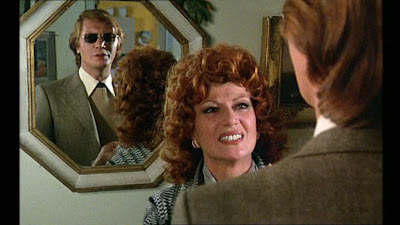 A difference between Minos and the typical giallo psychopath, and one that renders him closer to the example of Scorpio in Dirty Harry – tellingly the duel between Minos and Letellier later becomes increasingly ad hominem, though there is never the sense that they are in any way doubles – is that we never get any indication as to the cause of his psychopathology. While Letellier does get a flashback, by way of indicating that Marcucci was responsible for the deaths of his previous partner and an innocent bystander in a high-speed pursuit, again there is again no suggestion that he is particularly haunted / traumatised by the memory. Rather, Marcucci's escape seems more representative of an affront to his professional reputation, as signalled by the way in which he and his men actually celebrate with champagne on hearing that the Italian is back in town. 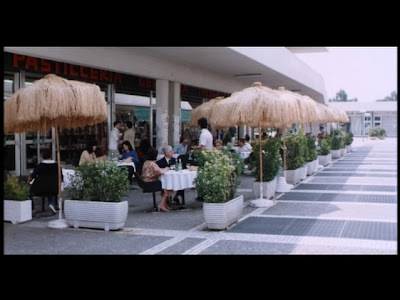 It is less about a compulsion to repeat and hopefully ultimately master a past trauma, in the classic psychoanalytic / giallo sense, as the return leg in which Letellier will settle accounts with the Italian. 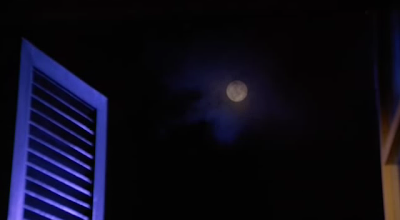 On reflection, there are a few sequences that don't quite work. 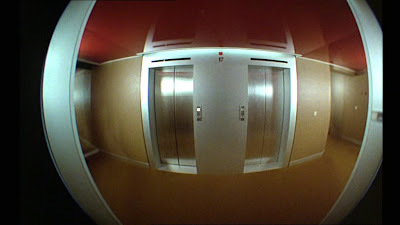 One is the aforementioned in which Letellier and Moissac arrive at the hospital and are joined by Minos in his regular guise as orderly Valdek. It feels slightly contrived in terms of the amount of time that passes between the scenes – how quickly did the detectives enter the hospital and find the nurse they wanted to speak to? how quickly did Minos get changed to join them? 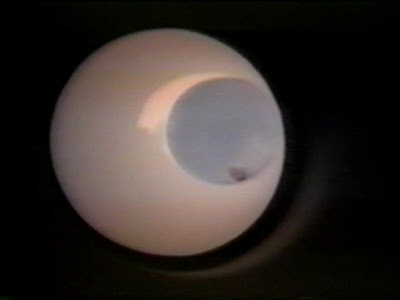 While excusable as contrivance to avoid revealing that Minos and the orderly are one and the same at this point in the narrative, that this same revelation is made barely five minutes later – with another indeterminate period of time in between – perhaps also suggests a slight uncertainty of intention in the overall dynamics of the piece. Likewise, the calculated games that Minos plays with the police here and elsewhere seem to make a mockery out of the psychological profile that we are given of him, by which he is outwardly normal except for when the need to kill overcomes him. As might be expected, the film's politics and morality are difficult to pin down. 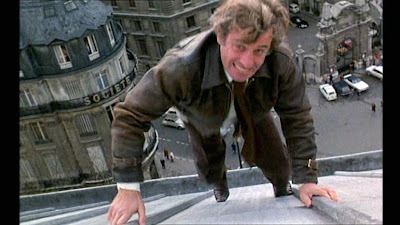 While Letellier and Moissac repeatedly bend the rules and use method of decidedly dubious legality there is not the sense that the law is in itself weak and ineffectual, as found in the aforementioned Dirty Harry or a plethora of Italian cop films from around the same time. Yes, the camera tracks back through an empty station office to rest on a sign that indicates we are outwith normal opening hours, but a call to the local station gets through.Yes, Letellier and Moissac are away from their car when the call comes through, but they are very much on the job, following up a lead on Marcucci. Indeed, the one figure who goes out of his way to (ab)use the system is a intellectual looking type who happens to be in the wrong place at the wrong time and who, it would seem, decides not to with their inquiries as a matter of political principle. As is often the case with this kind of film, however, most of these weaknesses and omissions only really become evident as you sit back and begin to analyse things. 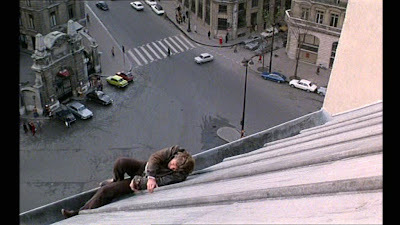 When actually watching Peur sur la ville it's hard not to be swept along by the wit of the Veber's writing, the performances from Belmondo, Denner's and Adalberto Maria Merli, Vernieul's assured direction and, above all, the sheer elan with which the action sequences are handled. Ennio Morricone's score, centred around a relentless percussive rhythm often overlaid with discordant piano, moaning harmonica or vocalism, is another asset, helping to ratchet up the tension and create the necessary air of unease. Considering the quality of Morricone's work on The Sicilian Clan, Le Serpent and Le Casse, the director and composer would appear to have had a trust and rapport.